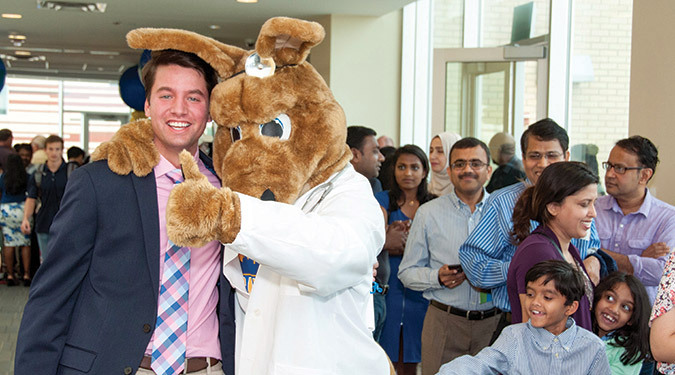 The application process involves two separate applications: the General Application for Admission to UMKC and the School of Medicine Online Supplemental Application. The required application fee covers both applications, and is paid at the time the applicant completes the General Application for Admission to UMKC. Students are encouraged to submit the General Application for Admission to UMKC online. The School of Medicine Online Supplemental Application must be submitted online. The General Application for Admission to UMKC and the School of Medicine Online Supplemental Application are due by this date. All supporting documents must also be submitted by this date (this includes reference forms, high school transcripts and test scores). Applications created but not complete by the November 1 deadline (11:59 p.m. CST) have until December 17 to complete and submit all application materials as a late applicant. Late applications will be reviewed with other late applicants and only if space is available. Applications that remain incomplete will not be considered for admission. The latest test score accepted as “on-time” is the October test date. Applicants applying as current college students must submit a college transcript complete with fall semester grades before the application can be reviewed for interview. Offers to interview will not be extended until the college transcript with fall grades has been received. Applicants who do not have an official transcript on file by January 21st will not be considered for admission. Note: for high school seniors, mid-year reports with fall semester grades are not required and will not be reviewed. Students interested in financial assistance (loans, grants, work study, etc.) are encouraged to submit the FAFSA (Free Application for Federal Student Aid by this date in order to receive priority consideration for such aid. In addition, students interested in School of Medicine scholarships must submit the FAFSA by this date in order to be considered. The FAFSA can be completed online at www.fafsa.ed.gov. Students being offered admission will be notified electronically of their acceptance to the program. Scholarship offers may also be made at this time. Students placed on the alternate list or denied to the program will also be notified electronically at this time. All admission decisions are communicated electronically, and will not be communicated via phone. Applicants who have been offered admission to the School of Medicine have until May 1 to make a decision. If the School of Medicine does not hear from the applicant by May 1, admission may be rescinded and offered to another student. The School of Medicine will begin extending offers of admission to those students who were originally placed on the alternate list. Offers of admission to alternate students are ongoing until the desired class size is reached.